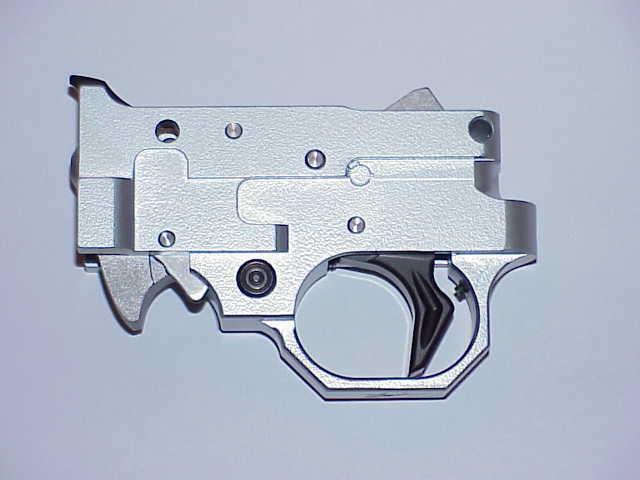 hardened steel components made to exacting tolerances to assure that every trigger let off is extremely consistent. dragging or inconsistencies caused by a conventional trigger plunger. Also included in the TG2000 are Volquartsen's custom springs, automatic bolt release, and extended magazine release. shooter who demands the very best. steel Semi-Auto 22 LR rifles. This TG2000 will fit the Ruger 10/22 in .22 LR only. The Ruger 10/22 Mag has different internal components. Look under the category for Ruger 10/22 Magnum Accessories for the TG2000 for the .22 Magnum. This is a great product. The trigger assembly scares me when I think of taking it appart to change anything. This makes it much easier to get a light crisp trigger pull. A MUST HAVE!!!!!!! Wow!! what a difference!! The trigger is so light and crisp!! very recommended!! If you had just one thing to buy for your 22, THIS WOULD BE IT! Awesome. Crisp & smooth, no travel what so ever. Nice Clean pull. A Dream! Even though the TG2000 costs a little more than I paid for the entire rifle, trigger pull is the single most important feature of a firearm. The Ruger 10/22 is a fine design, but many of the factory features do not meet the potential of the design and the trigger group is one of them. The factory trigger is spongy and is about 6 lbs on mine. The TG2000 is a crisp 2.5 lb or so pull, and beautifully machined compared to the Ruger TG. Replacing the factory trigger group, extractor, charging handle and recoil buffer with Volquartsen parts has made a world of difference. I would replace everything, but then I would have a $1200 10/22! This is the first thing you gotta get for your 10/22! I love that I don't have to use two hands to release the bolt lock. Just slide the bolt back a bit and it releases freely from locked position. The ease at which you can remove a magazine is also very nice. The trigger feels perfect too. My dad shot mine and he got one for his 10/22 the next day! Oh my god, this trigger group is stunning, it's almost to good for words. It was a simple job to fit it to my Dlask receiver and the trigger is like butter. Everyone who shoots it just starts smiling ear to ear. The only drawback with this trigger is your ammo consumption will go up, because shooting with it is so much more fun! nice crisp and light had to file material out of stock in order to fit due to oversized safty. One sweet trigger assy.It took no time to install it and the trigger pull is reduced.A MUST HAVE. Need a rating above 'Superior' for this. For me, who doesn't like to get into the guts of firing mechanisms, this was just what I wanted to get a lighter trigger pull. Much superior to the factory part. Meticulously machined. No bubbles, burrs, scratches, or obvious flaws. Just beautifully fitted components. Easily installed into the receiver, then snugged right down into a Hogue overmolded stock with fitting or modification. Under 0.5" group at 50 yards with Wolf Match Target ammo. Fast delivery from Rimfire Sports & Custom, to boot.